In this video we want to describe the nucleophilic substitution mechanism of halogenoalkanes or alkylhalides. There are 2 different pathways for nucleophilic substitution. SN1 mechanism is a two step reaction. Let's use this tertiary halide as an example. 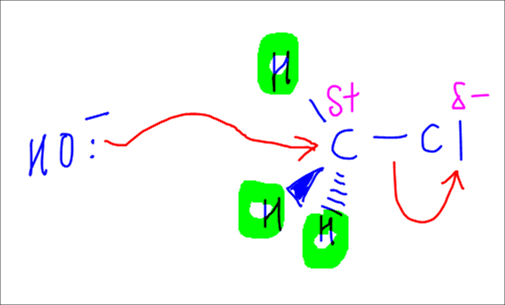 In the first step, which is the slow step, the C-Cl bond will break by itself and both electrons will go to Cl. A carbocation intermediate and Cl- ion will be formed. In the second step, which is the fast step, OH- will attack the carbocation forming the alcohol product. Based on the mechanism, we can deduce the rate equation. In the slow step, there is only one halogenoalkane, hence the rate is first order with respect to halogenoalkane and zero order with respect to hydroxide. The overall order is one, hence we call this the SN1 mechanism. Tertiary halides will favour SN1 as more electron donating alkyl groups can stabilise the carbocation intermediate to a greater extent. Therefore the carbocation is more likely formed, and this in turn favours SN1 mechanism. SN2 mechanism is a one step reaction. Let's use this primary halide as an example. 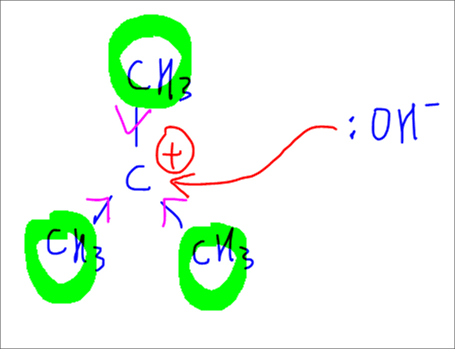 The OH- nucleophile will attack the carbon from directly behind the C-Cl bond. In this step the C-O bond is formed while the C-Cl bond is broken. Usually in schools we are required to draw the transition state, which emphasises that the OH, C and Cl groups are along the same axis. Since this is the only step in SN2, it must be the rate determining step. One halogenoalkane and one OH- are involved, hence the rate is first order with respect to both halogenoalkane and OH-. The overall order is two, hence we call this the SN2 mechanism. Primary halides will favour SN2 as there are less bulky alkyl groups. 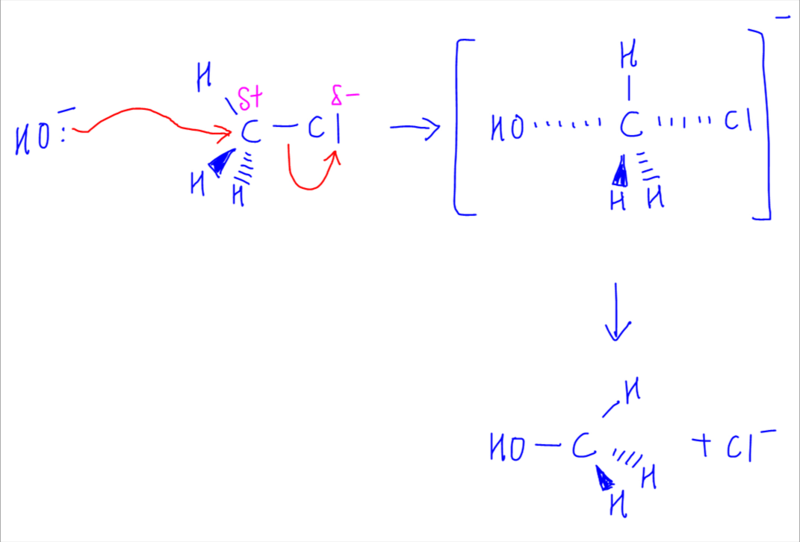 This means that the nucleophilic attack from directly behind the C-X bond will experience less steric hinderance. This makes the back door attack occur more readily and hence favours SN2 mechanism. For the detailed step-by-step discussion on how to draw both SN1 and SN2 mechanisms, check out this video! Join my 1000+ subscribers on my YouTube Channel for new A Level Chemistry video lessons every week. Need an experienced tutor to make Chemistry simpler for you? Do consider signing up for my JC Chemistry Tuition classes at Bishan or online chemistry classes!